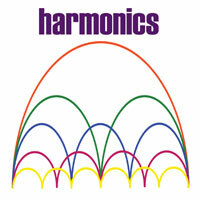 A harmonic is "an overtone accompanying a fundamental tone at a fixed interval, produced by vibration of a string, column of air, etc. in an exact fraction of its length". My first encounter with them was as a teenager, watching mystified as Rory Gallagher moved his hands down the neck but the notes played got higher! I eventually learned what they are and to this day, remain fascinated by the bell-like purity of guitar harmonics. For this project, harmonics of any kind were deemed acceptable, even "comb filter resonance" which Michael Peters assures me are harmonics. I sampled a single harmonic played on acoustic guitar. The entire track is built from this one sample, which is treated with a number of fx and sequenced. Your first CT offering Andy, but I hope it won't be the last. You've managed to squeeze an amazing sonic variety from one loop, imagine if you'd used two loops! Love the opening tone of the tense string, nice evolution. more than honorable first contribution. thanks andy! Fascinating what you can do with one tone. Killer opening track! Harmonics, created on guitar using the same technique as Hans Reichel Playing behinds the bridge creates a lots of subtle harmonic tones. The recorded sounds are then manipulated in Wavelab with some vst effects. Roger pleased to see you in Ct...., wonderful how connected we all are in these various communities. I hear your dense dark northern tones throughout, good piece. Harmonics in this composition are created by bowing several small strips of metal with a toothbrush. Besides, I use a rubber bow rubbed on the wood which created rough harmonics. "Unexpected Harmonics" is a melancholic composition. Lovely sounds, this reminds me of Reichels Daxophone sounds but more metallically. Like the way you work with the dynamic. Michael vast and atmospheric as always, almost hear so much Fripp in your work, excellent. michael, your work has reached such a level of maturity that everything you do, either more accessible or experimental, is always of the highest quality. created from overtones played on piano strings. I like to think it conveys some intricacies of clockwork. this is the kind of track you'd expect to hear from an experimental music group that contains sampled piano harmonics, and not what I did :) one of my favorites. I´m partial to this kind of sounds, lovely, in the middle I can hear a glint of Zga before it ends. wonderful. Where is the Like button on this website? wow Rick pleased to see you in CT... maybe you have been on other projects but nice to see you here, lovely piece and love the title most of all. i love savage music and this certainly is. A kaleidoscope of sounds meet me and the track grows in a nice way. I used recordings made in Pecs, Hungary and a sample from a live performance with The Hat Effect. To create the harmonics I fed 3 tracks of the four-track recorder with the same recording, each with a slightly different pitch. The development of the piece is of course due to the many recorded fragments I used. Extra voice on "Welcome to the Crypt" is by Jeff Surak. wonderful documentation scape Rinus, nice to run across your creativity again. i enjoyed a great deal, rinus and roger most adventurous & radikal approaches. well done guys! for a subtle track ! great !!! raül bonell: electronics / imma tomàs: piano. lo-fi recording of piano overtones into five12 numerology, triggered using the onboard 'evolve' functions. idem with the internal OS X speech voices, driven by numerology algorithms. incidental sounds build ITB using additive synthesis (which was born out of the overtones physics!) no samples, except for the piano. highly creative and mysterious Raul. what a great composition ! probably my favourite one ! Very nice texture here, the dynamic mixtures with the sounds. Good composition! Innovative! Really liked the vocal treatments. Very interesting and mysterious. Bowed cello harmonics sampled and played back via midi keyboard. I was listening to this atmospherically charged piece when the skies unleashed an almighty crack of thunder - fitted right in! i'm basking with all those clusters of noises and very high pitches fighting on top. beautiful, steve! Nice rigid acoustic sound here, you can hear the harmonics very clearly and the track is growing beautiful. Harmonics generated by electric guitar and then processed by Line 6 M9, primarily the Frequency Shifter/Ring Modulation settings, plus various delays and reverbs, with post-production re-pitching in Acid Pro 6. At various points, the random harmonics generated by a Fernandes sustainer guitar were added to the mix. You have a disconcerting knack for producing my favourite track on almost every project you submit to. Once again, an intelligent, thoughtful and intriguing piece of music! Nick - that's most generous - thank you. You keep on bringing these intriguing concepts to the CT table, it's always such a pleasure to explore the possibilities they suggest. a complex & elaborated o(ve)rtones arrangement. another favorite.